The African American population of the Detroit Metropolitan area in 2014 was 961,871 making it the 10th largest Black population of any city in the United States. 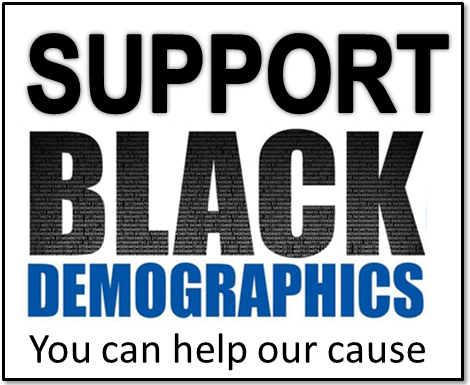 This is almost 70,000 fewer African Americans than in 2000 when the Black population was more than 1 million. White Flight and the massive loss of manufacturing jobs over the last few decades led to negative population growth in this region. 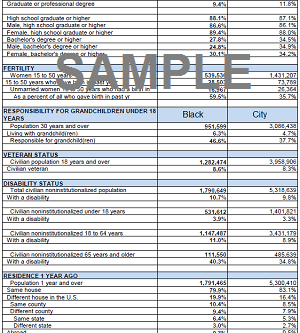 As the population in the Detroit area as a whole declined the Black population also decreased and now ranks a few positions lower among other cities than it did just 20 years prior. Black Detroit has a very interesting history. African Americans migrated to Detroit in very large numbers during the “Great Black Migrations”. The largest percentage came from Alabama, while many others came from Georgia, Tennessee, and Kentucky. This increased Detroit’s black population from under 6,000 in 1910 to 120,000 in 1930 during the first Great Migration and by the end of the second migration the Black population in Detroit grew to more than one million. The city of Detroit once boasted the largest Black middle class in America. However after the riots in 1943 and 1967, and school desegregation, the White population left in such large numbers that today the city of Detroit has the largest Black majority (84%) than any other large city in the nation. It is also the most segregated of all large cities with urban Black population percentages in the 80s and most suburban White populations above 90%.